With its fast data rates and reliable performance, the SanDisk Ultra CompactFlash memory card helps you get the most out of your camera, camcorders and other devices that support CompactFlash memory cards.Great photography takes more than a great camera, so step it up with high-performance SanDisk Ultra CompactFlash memory cards from the global leader in flash memory cards. The SanDisk Ultra CompactFlash memory card delivers excellent shot-to-shot performance. The SanDisk Ultra CompactFlash memory card's fast data speeds decrease latency between shots, so you can take photos in rapid succession. You can also enjoy faster image viewing and more efficient in-camera editing. The SanDisk Ultra® CompactFlash® Card works with any device that features a CompactFlash card slot and it allows you to keep shooting photos and videos without wasting time reviewing and deleting to free up space. Even with Full HD1 video and high resolution images hungry for storage space, there’s plenty of headroom, just in case. Great photography depends on performance that can capture every shot. SanDisk Ultra® CompactFlash® Card feature ultra-fast transfer speeds of up to 50MB/sec** when moving your work from the card to your computer. Whether you are shooting video or taking photographs of action and sports, your SanDisk Ultra CompactFlash Card will keep up. 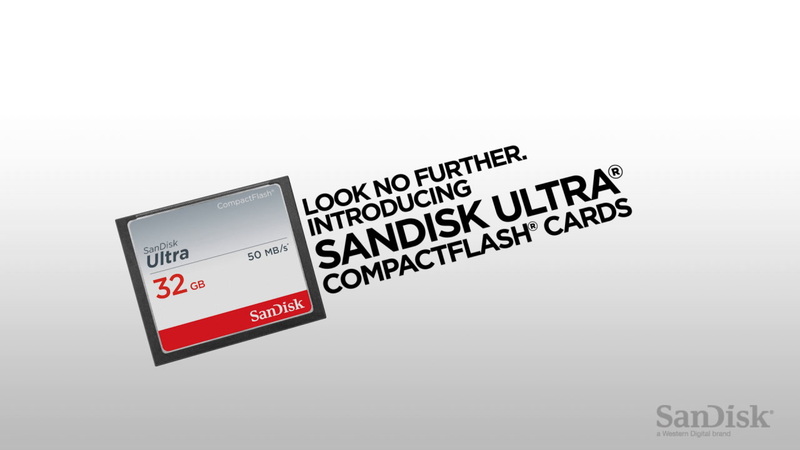 SanDisk® develops and engineers its CompactFlash Cards to maximise reliability, so you can count on your SanDisk Ultra® CompactFlash® Card to store your important memories. The amount of capacity you need depends on the type of files you have, how big they are, and how many there are. The chart gives you an idea of how many photos and videos you can cumulatively store for each capacity. Give your DSLR and HD camcorder a performance boost. With high capacities, fast data rates and reliable performance, SanDisk CompactFlash and CFast Memory Cards help you get the most out of your camera, camcorders and other compatible devices. Faster read speeds mean you can transfer large photo and video files more rapidly from your card, giving you an increased workflow efficiency allowing you to spend more time editing and shooting. Based on internal testing; performance may be lower depending upon host device.1MB=1,000,000 bytes. With higher write speeds come faster shot-to-shot performance and better use of advanced camera functions, such as multiple frames per second shooting and continuous burst mode shooting. Based on internal testing; performance may be lower depending upon host device. 1MB=1,000,000 bytes. *Up to 50MB/sec read; write speed lower. Based on internal testing; performance may be lower depending on host device. 1MB=1,000,000 bytes. 2 10-year warranty in Germany, Canada and regions not recognising lifetime warranty. © 2018 Western Digital Corporation or its affiliates. All rights reserved. SanDisk, SanDisk Ultra and CompactFlash, Extreme are registered trademarks or trademarks of Western Digital Corporation or its affiliates in the US and/or other countries. All other marks are the property of their respective owners.